While the AMA is fortunate to have dedicated, outstanding groups of physicians in a variety of recognized leadership roles – such as its Board of Directors and Representative Forum – there are thousands more physicians working diligently throughout the province, investing long hours in rural and urban practices, clinics, hospitals and universities, providing Albertans with the best health care possible. Through the AMA Youth Run Club, a partnership of the AMA and Ever Active Schools, physicians, medical students and residents can meet with the children, teachers and families of your communities to encourage physical activity and healthful living. Many doctors donate their time and services to good causes both here and abroad. Read profiles of our member physicians and their colleagues and projects that are making a difference. Alberta’s doctors, through the Alberta Medical Association, have established albertapatients – an online, members-only health care forum – to engage in dialogue about health care in our province. 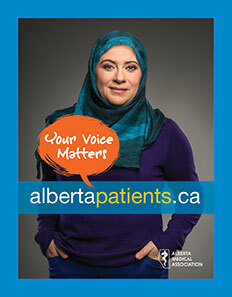 Albertan's have a voice and Alberta’s doctors want to hear it. AMA members and their patients benefit from our work on clinical and health issues. Find out about AMA patient-centered initiatives. Advocacy is an important component of the doctor-patient relationship and physicians should individually and collectively, advocate with their patients. Advocacy involves the responsible use of expertise and influence to advance patients health care interest. Find out how the AMA has influenced health policy to meet the health care needs of Albertans. The AMA Indigenous Health Policy Statement confirms the AMA’s determination to be leaders in addressing past and current injustices to Alberta’s Indigenous communities. The Indigenous Health Committee has been established to promote and operationalize the recommendations in the AMA Indigenous Health Policy Statement. It is an ongoing ad hoc committee of the AMA that reports to the AMA Board of Directors indirectly through the committee’s Senior Management member, Dr. Lyle Mittelsteadt, Assistant Executive Director of Professional Affairs.